I have just finished watching Julie & Julia, a movie contrasting the lives of Julia Child (a chef and cookery book writer of 1950s) and Julie Powell (a New York based blogger & aspiring writer). And though I am neither a great cook nor a foodie, I simply loved the movie and couldn’t stop myself from writing about it. The movie was released in 2009 and is based upon Julie Powell’s book of the same name, based on Julie’s own year long experiment. Julie is employed in Manhattan as a secretary and is supposed to provide support to grief stricken people in the aftermath of Twin Tower tragedy. Depressed with her unglamorous job, Julie challenges herself to cook all of the 536 recipes cataloged in Julia Child’s famous book ‘Mastering the Art of French Cooking’ in a year. And to make it more fun, she decides to blog about it. As the story proceeds, two parallel plots run, one tracing Julie Powell in early 2000s struggling to create a balance between her job, passion and marriage while the second plot traces the life of Julia Child in Paris where she in almost similar circumstances, is trying to write her first ever book, actually just co authoring with two of her fellow food lovers. 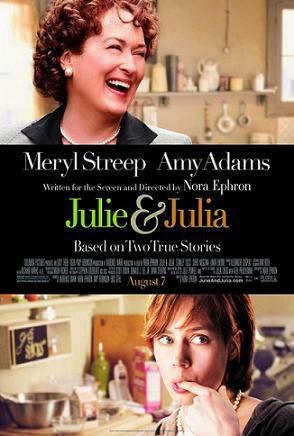 How the two women put up a brave front in face of their initial failures, the disappointments meted out to them by strangers and loved ones, forms the basic premise of the story and in wake of superb performance by Meryl Streep and Amy Adams, the film turned out to be a great entertainer. Streep portrayed the role of the optimistically chirpy yet slightly confused Julia Child excellently and it was a pleasure to listen to her delectable Frenchified English. But more than anything, I found Julie & Julia special as it emphasized the delicate relation between a reader and a writer. How Julie gets all worked up about an old cook book, desperate to share her experience on internet, in a bid to share her innermost emotions with strangers on her blog, is something I can totally identify with. Moreover, whenever I read a particular book, I begin to judge the author by the impressions his creation makes on me. And I found Julie to be quite similarly affected by Julia. She begins to feel a special connection with Julia, almost talking to her as an imaginary friend, proud to be able to try out her recipes and even getting enthused about meeting her ideal at least once. But, we readers are indeed excessively senti and often whatever image we have about a writer, is just a teeny tiny part of her personality, more often than not, a hidden one. So when we finally get to meet our ideal or hear from him/her, it may turn out to be quite different from our expectations. And in Julie & Julia, this tricky part was well presented. Another impressive element of the movie was the inspiring struggle of both the women. All of us have to fight our demons. Not everyone is courageous enough to pursue his passions, realize his dreams or even bold enough to take initial failures in stride. But both the heroines come out as winners as they refuse to be budged by their momentary weaknesses and steadfastly move towards their goals. The icing on the cake is that Julie & Julia is one of those rare movies based on a book, that has made me curious to read the original work. I even read a few posts on Julie/Julia Project on her blog where Julie originally chronicled her ingenious challenge. You can indulge in the creamy batter of Powell’s cake here. A truly inspiring movie. Well acted and well presented. A must watch for every passionate creator! You can get more info about the movie on Wikipedia or else buy a dvd from Amazon or Flipkart. Sounds Interesting. Quite an original plot I must say. Yeah it was definitely interesting and I hit upon it quite by chance.